Iain Small approaching the roof on pitch 1 of the Moth Direct. After the first couple of pitches I didn't get the camera out much. It wasn't really photography weather! Last week I was sat in my car Dumbarton just after climbing Gutbuster. 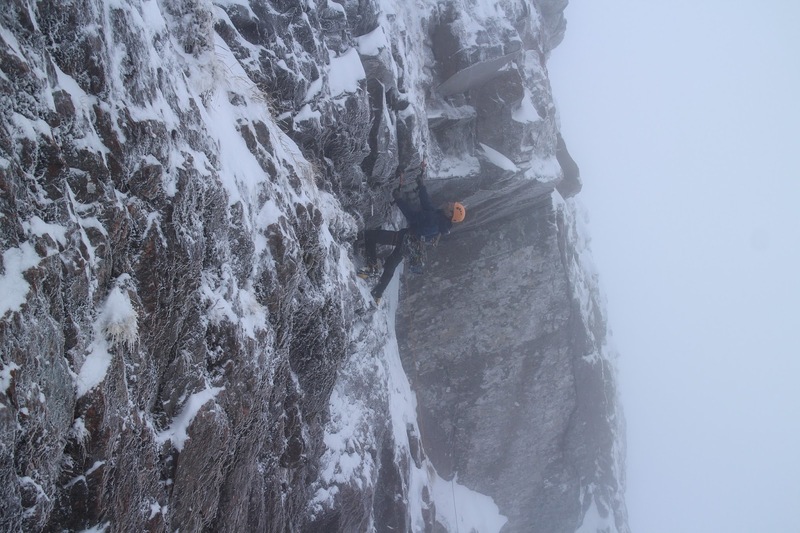 I had arranged to climb the following day on Crag Meagaidh with Iain Small and Helen Rennard, with a rough plan of doing a direct start and finish to ‘The Moth’ VII,8, a 380 metre route first climbed by Es and Guy on the Pinnacle Face. We looked at the wind forecast and postponed. I’m glad! Iain heads up into the morning gloom at dawn. We reconvened at the Meagaidh car park at 5am yesterday and marched into Coire Ardair under leaden skies but fairly benign weather. In Raeburn’s Gully, Iain pointed out the first couple of pitches (beyond that it was in the cloud). The first pitch looked really logical, taking a nice dribble of ice emanating from a roof, then stepping left and pulling over the roof to gain the ledge Es and Guy had traversed in on to reach the main corner system on pitch 2. Iain made chilled out work of the pitch, as he does. I then lead the crux of The Moth which had a fun ‘Quarryman’ style crux palming off a corner. 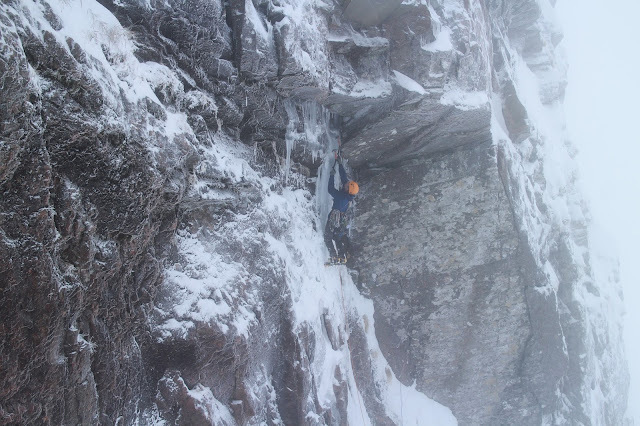 Iain rapidly dispatched the following 2 pitches (run together) and then I led an 80 metre pitch (with 10m of moving together of course) that was standard Meagaidh tech 5 icy face climbing with basically no gear and eventually found a belay below the barrier wall that tops the buttress. Iain launched up the steep wall directly above the belay and made it to a the next ledge just as darkness fell. From here Es and Guy escaped rightwards along the ledge in the dark and deteriorating (thawing) weather. Iain on the hardest part of the first pitch. Great climbing with a good bit of gear. We followed in the dark. The wall above still looked steep at first and well rimed up at this height, it wasn’t clear where to attack it. 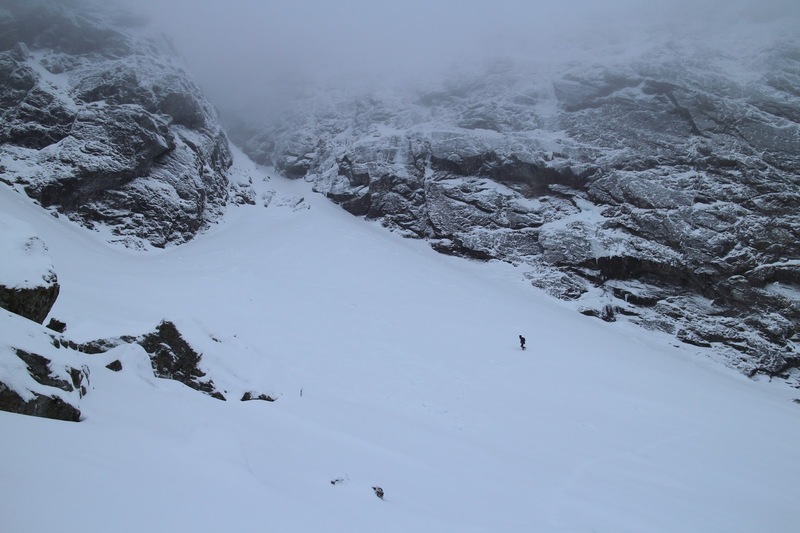 I led off up a bulging wall, with one well placed cluster of runners to encourage me to keep going up, followed by a long groove which was great except there was basically no protection and the updraught was hammering my eyes and face with spindrift every time I looked at my feet. This still didn’t make the top. But thankfully the final pitch was easier and led us to a wee cairn at the top of the Pinnacle. One of the side effects of always trying projects which are super hard for me is I don’t get out and about ticking loads of easier routes on nearby crags. It's kind of odd that Meagaidh is less than 20 minutes drive from my house, but I’d only ever done two routes on it before yesterday. Hopefully I can start to address that issue! It was the same with Binnein Shuas which is even closer. I hadn’t done anything there at all until recently and now have done several E7s and two E8s. Yesterday I was also thinking about my rather harder project on Binnein Shuas which escaped last year thanks to my shoulder accident in July. 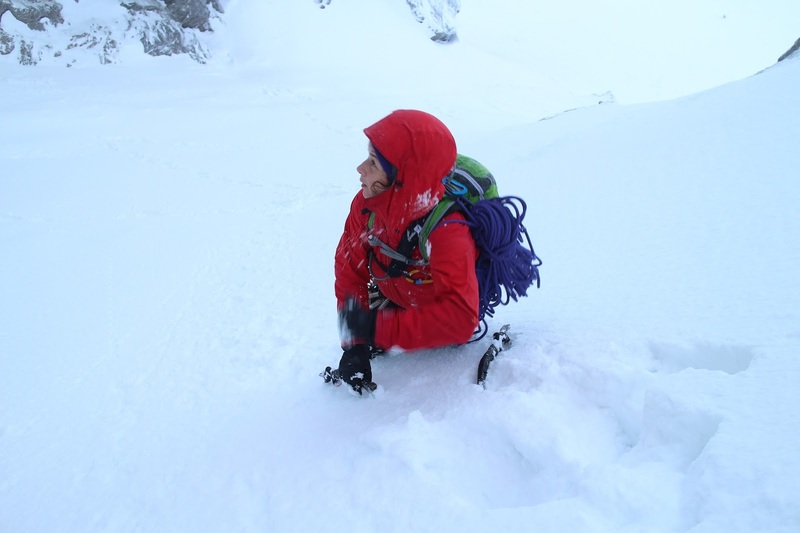 Ideally there is time for some more winter routes before that project thaws out and I can get started on it again. Helen eyeing up the line from Raeburn's Gully.